Gmail has long supported pulling in email from other email services, but unless you wanted to combine both business and personal accounts into one account (a no-no) it's never been easy to manage the multiple accounts. Google fixed that with the latest update to Gmail. Where in the past, you had to open the navigation drawer and switch accounts before seeing all your mail, now the Gmail app shows all your emails in a single unified inbox - including @outlook, @yahoo, and even @NotAnAmazonSecrectAgent. 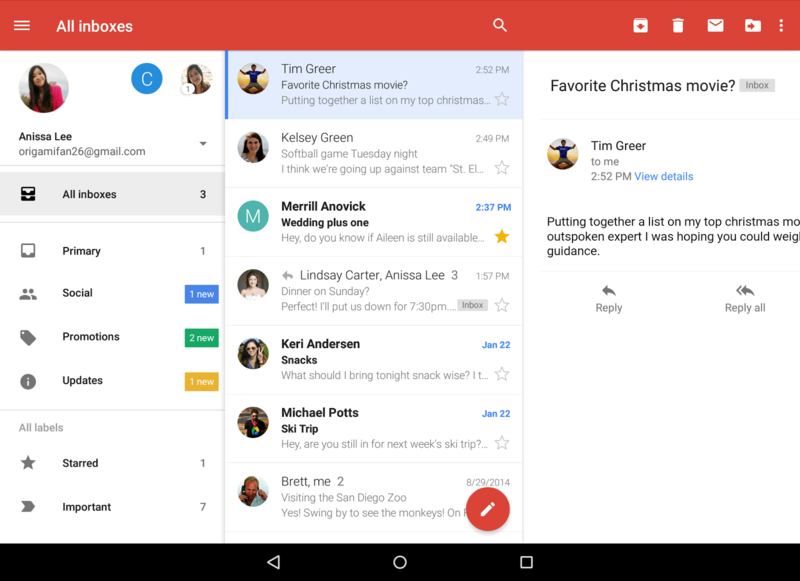 And as you can see in the screenshot below, Google also refreshed the app with a radically changed interface which is reminiscent of the experimental Inbox app. Today’s update also adds responsive animations (like when you open and close a conversation), the option to save to Drive with only a couple taps (it takes two, not one), and a new larger preview which will give you a better idea of what’s inside. There's a new compose button in the lower right corner, and Google has also improved the auto-complete function in the search box. Google's also taken the liberty of reformatting your emails. All emails, including the ones from non-Gmail accounts, are now shown in Gmail's conversation view. This means the emails will appear neatly stacked as one conversation, allowing you to easily know the context of a message.